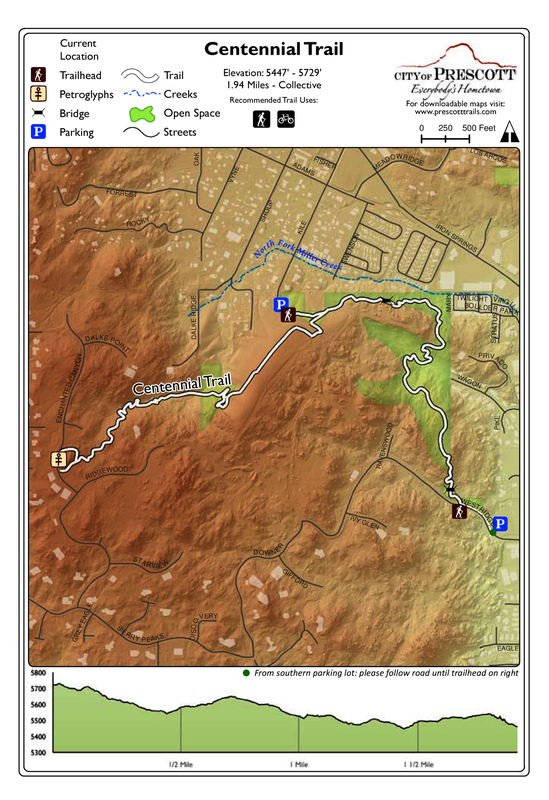 Centennial Trail - Prescott is a 2 mile one way hike with 521 feet accumulated elevation gain. Located 3 miles southwest of Prescott Arizona. October and April are the best months to enjoy this hike. An in-town trail that meanders through the boulders and canyons, with panoramic views of the City of Prescott, Rodeo Grounds, Thumb Butte, and Granite Mountain. Petroglyphs are a feature of the trail. Parking is off of Kile Street near Iron Springs Road, with a 2 mile out-an-back in either direction.